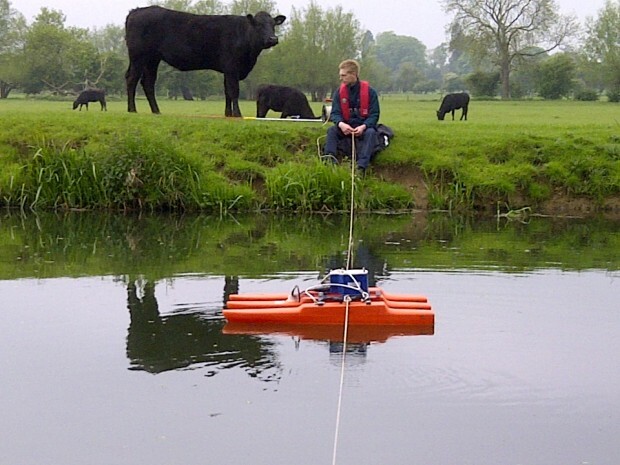 In my last blog I told you a bit more about the work I do as a Hydrometry and Telemetry Officer. Now its time to get to the techie bit and a spot of background. River gauging at weir sites is a core activity for Hydrometry and Telemetry, to ensure our river monitoring is accurate and reliable, whatever the river is doing. 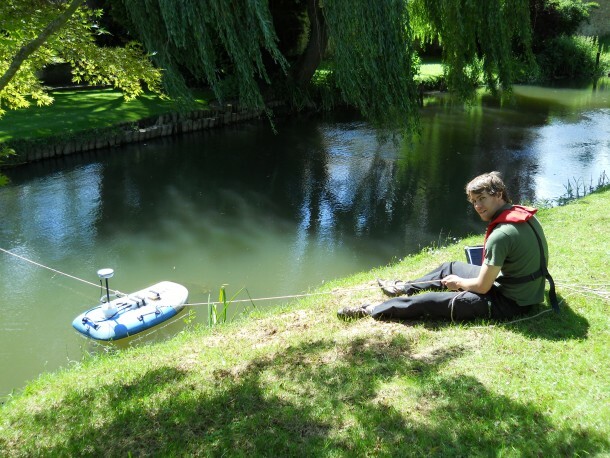 We use an Acousitc Doppler Current Profiler (ADCP - basically a miniature submarine sonar - which targets tiny particles in the water, measuring their velocity as well as the river bed) to measure a “slice” of the channel, which gives us a total flow. This is measured in cubic metres of water, per second, or cumecs for short. We can then use this data back in the office to review the site and check that the weir is reading accurately. At our first site, we work as a team; Rob won the standard game of rock/paper/scissors and elects to stay dry so whilst he completes our standard checks on the site, downloading and recording water level data, I am taking care of the site itself. I don my drysuit and lifejacket and start clearing weed, scraping the weir and setting up the ADCP on my Toughbook so it’s ready to go. Clearing weed is important to ensure the weir is operating reliably, and to make sure the ADCP will function correctly, although sometimes I feel like I get a little too close to nature! Our day is made when we spot an otter popping out of the river one side of the weir, scurrying down the side of the structure before heading off downstream. Rob makes his way over the far bank of the river the ADCP is attached to the ropes and we pull it back and forth across the river, changing settings a few times to ensure we collect the best data. Sitting just upstream of Milton Keynes and a little way upstream of Stoney Stratford sluice, our site at Passenham is slightly different to our traditional, run of the mill weir sites. It goes by the name of a ‘time of flight ultrasonic flow gauge’. 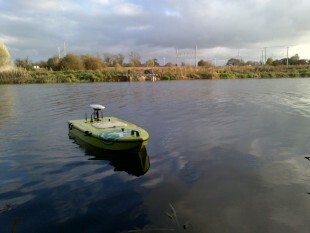 This again sounds complicated, but in reality is based on similar technology to our ADCP, the only difference being that this site fires pulses of sound diagonally across the river to a receiver. The time it takes (i.e. time of flight) is measured and from that, the water velocity is inferred. Confused yet? I was when I first came across these terms! On the bright side the channel is too big to get in safely and weed is not a problem at this site so neither one of us needs to get in! On the downside the rope game is quite a challenge but this time I emerge victorious with a monster of a throw. Unfortunately for Rob, our efforts seem to attract the attention of one of the local cows!